It is the meek of the earth that God will teach His way as they are attentive to His Holy Spirit. The world will say you are not suppose to judge, but it is the meek God will guide in judgment. (Psalm 25:9-10) The meek will he guide in judgment: and the meek will he teach his way. All the paths of the Lord are mercy and truth unto such as keep his covenant and his testimonies………. (Psalm 97:1-2). His people are known as the seed of Abraham and He was told I will bless those who bless you, and curse those who curse you. There is a blessing that follows Gods people throughout their lives. It is the meek that will inherit the earth! 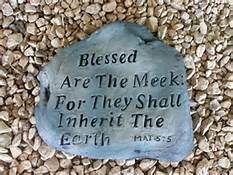 (Matthew 5:5) Blessed are the meek: for they shall inherit the earth……… (Psalm 37:11,22).